You've probably seen structures like that before. Temporary panels that cover a store front while the inside is being renovated. But I bet never in the shape of the actual merchandise! You can click on the images above to see original tweet and twitpic by Giovanna Battaglia. O stylish one, come get your award! 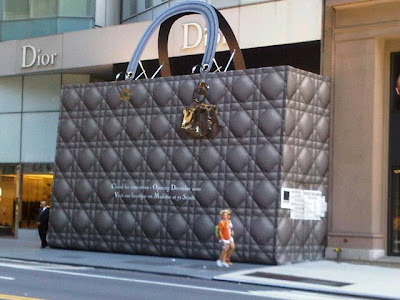 stn paradeisoo vriskesaii me autin tn tsanta..
OMG.. if i pass next to that shop I would die.. and probably try to buy that bag..